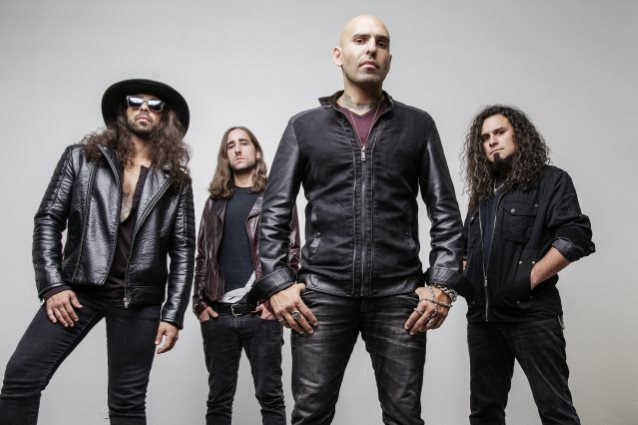 Las Vegas rockers OTHERWISE are will release their third full-length album, "Sleeping Lions", on September 22 via Century Media. You'd be hard pressed to find a more fitting album title than "Sleeping Lions" for latest studio release from OTHERWISE. The album hits like a revelation, jolting the listener upright and transporting them from a dreamy landscape to a wide-eyed state of consciousness textured by humility and sandblasted by the winds that weather life. "We named the album 'Sleeping Lions' because that's what we feel like - we've been hibernating in our neon desert cave, licking our wounds and regaining our strength for the hunt," says OTHERWISE frontman Adrian Patrick, who along with guitarist Ryan Patrick, form one of the most incendiary sibling duos in modern music. "Now we're back on the prowl again, and our eyes are wide open. The album title absolutely references a bigger awareness of who we are and what we're capable of. The last thing you ever want to do is wake sleeping lions." The twelve-track epiphany runs an emotional gamut that juxtaposes the very nature of the recordings, "Angry Heart" flowing with the frontman's blistering vocal cadences as he "fills with hate" and "embraces the monster I'm becoming." As quickly as it boils over, the rage subsides on "Blame", one of the most sensitive statements of the band's career. "If it makes it better for you, just blame it all on me," the frontman pines, bleeding into the emotional effervescence of "Bloodline Lullaby", a heart-wrenching ballad of epic proportions. OTHERWISE is a band built on emotion and fueled by the feelings that drive our lives. Anger. Regret. Love. This isn't packaged rebellion, it's the real world. And it's what makes the band — and album — connect at such a visceral level. "Emotion is the most important element of our writing process," Adrian says. "We try to capture every aspect of the human condition so the subject matter of our songs runs the gauntlet of what it means to be alive. Every lyric comes from a very genuine and heartfelt place. There are no fictional storylines or tough-guy rhetoric in any of our tunes." One of the album's more mature musical excursions, "Monster" takes flight in a flurry of programmed embellishments and supple guitar play, an unbridled reminder of the relationship that destroys us all but we just can't bring ourselves to leave. The risks continue on "Nothing To Me", where the symphonic grandeur boils over amidst emotional disrepair, and "Suffer", where the guitars jangle more than mangle, conveying a melodic appreciation that far outweighs a more pedestrian quest for being heavy. "As artists, evolution is the lifeblood of creativity," continues the singer. "We spread our musical wings a bit more on this album in a concerted effort to remain true to ourselves and not conform to what others expect of us. Rock and roll is all about taking risks, and that's what we do best. If we were forced to stagnate or remain trapped in the same stylistic box, the fire inside us would burn itself out." One can confidently call "Sleeping Lions" the most mature chapter of OTHERWISE's impressive volume of work, but don't mistake mature for soft in the middle. Quite the contrary, the band's evolution is poignant both musically and lyrically, and they steer clear of the awkward growing pains that so many other bands endure. That's a bold statement when talking about a band whose had four singles crack the Top 20 at Active Rock radio — "Soldiers", "I Don't Apologize (1000 Pictures)", "Darker Side Of The Moon" and "Coming For The Throne" — seen "Soldiers" alone surpass eight million streams on Spotify, toured alongside such heavy hitters as STONE SOUR and PAPA ROACH, and shared festival stages on land and sea, appearing anywhere from Rock On The Range to Shiprocked, and everywhere in between. "Both 'Weapons' and 'Sleeping Lions' are special to us on several levels," the singer continues, pointing out a few of his favorite tracks. "Not only were they co-written with two of our idols, but 'Weapons' can absolutely be considered social commentary and 'Sleeping Lions' is basically our protest song. Album closer 'Bloodline Lullaby' serves as a tribute and legacy for our family, while the bonus track 'Won't Stop' is an anthem for our better angels... We try to infuse a sense of hope into all of our songs, regardless of how angry or sad or introspective they may seem. It's always an intentional goal of ours, to leave everyone, including ourselves, with a feeling of empowerment. We are eternally seeking the light through the darkness."